SUMMARY: We asked speakers, sponsors and attendees of the upcoming Email Summit what is the most important information they would like to know about potential customers. We then posed those questions to 2,057 people to see what U.S. adults thought about the email marketing you send them. 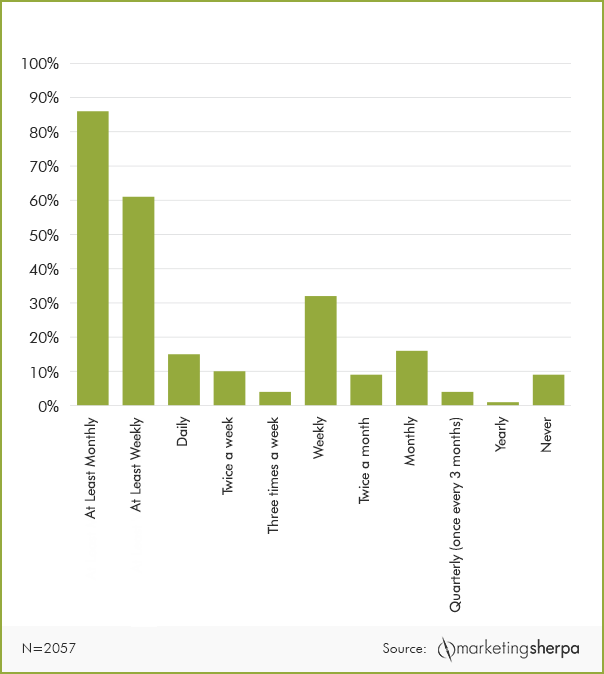 In this week’s chart, we share what customers think about promotional email frequency. Q: How often, if ever, would you like to receive promotional emails (e.g., coupons, sales notifications) from companies that you do business with? Note: The data has been weighted to reflect the composition of the adult population. Propensity score weighting was used to adjust for respondents’ propensity to be online. The conventional wisdom is that people do not want to receive email, and they especially do not want to receive promotional email. There are a slew of venture-capital backed startups with “new messaging innovations” that are certainly beating that drum. According to our latest research, however, conventional wisdom is wrong. A vast majority of Americans (91%) do in fact want to receive promo emails. While 86% would like to receive promo emails at least monthly, 15% would like to receive promotional emails every day. To me, this points to the importance of segmentation. If you’re sending daily emails to people who only want monthly emails, they are likely to unsubscribe or mark your email as spam. Likewise, if you’re sending monthly emails to the 15% who want daily emails, they will feel underserved, and there will be a void that might be filled by your competition. Have several newsletter or email sign-up options available when customers opt-in to receive email. The more options they select, the more frequently they receive email. Clearly list the cadence of your different newsletters and email lists on the opt-in form so customers can self-select how often they want to receive email. Have a single email sign-up and send less frequently, giving customers an option in those emails to sign-up for more frequent emails (perhaps even just during your high season, e.g. from Thanksgiving to New Year’s Day). For customers who click on the unsubscribe link, give them the opportunity to opt down (receive email less frequently), not only to opt out. Test different frequencies, and see how they affect total revenue and unsubscribes.